Ramey used a late spurt to put away Ray Allen Select on Saturday. They got a ton of second chance baskets from Daugherty along the way. The 6-foot-7 wing was constantly cleaning the glass and recording put backs. A plus-length, bouncy prospect, Daugherty can do a lot above the rim. His perimeter skills need to catch up, but he can size guys up from time to time and create offense as a slasher. When Daugherty was engaged and played with a high motor, Ramey was a different team. Johnson continues to get better and better and add things to his game. The 6-foot-4 guard isn’t known as a guy who can bang under the rim, but he had some momentum changing put backs on Saturday, showcasing some added strength. Defensively, Johnson is a pest with excellent hands. He plays the passing lanes and anticipates at a high level, always good for a few takeaways each game. His offensive skillset has grown in the past year as well. 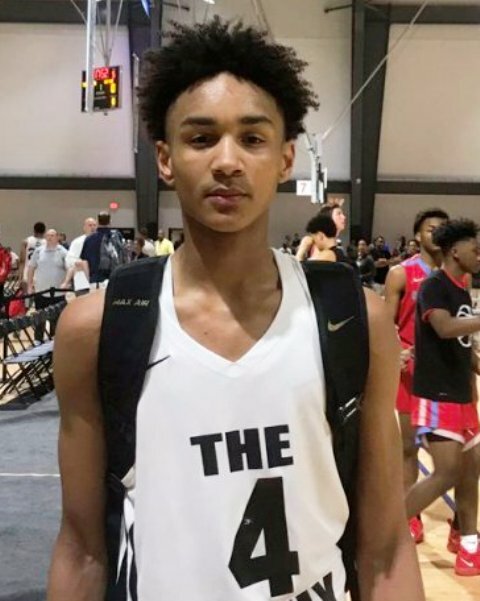 Comfortable spotting up for open shots or slashing to the basket, Johnson is giving himself a chance to gain high major offers. Johnson and Breakaway Basketball just wouldn’t say ‘die’ in a loss to the Wisconsin Swing. No matter how many punches the opposition threw, it always seemed as if Johnson answered to keep his team in the game. The unsigned senior knocked down tough shot after tough shot on Saturday. A 6-foot-3 wing with a strong build, Johnson is an excellent mid-range jump shooter. He likes to get into the 12-15 foot range and rise and fire. Johnson finished with 19 points in the loss. Lindsey shook off a rough spell from Friday night and went for 22 points to lead the Swing past Breakaway. Looking to improve his scoring ability off the bounce and willingness to finish against contact in order to draw high major offers, Lindsey had a very strong spurt in the second half to help put the game away. The 6-foot-4 sniper had a couple of tough drives that turned into 3-point plays, despite Lindsey taking hard shots into his body. Lindsey also hit some tough shots off the dribble, either shaking defenders with a step-back jumper or stopping on a dime as his man went flying by. In a high level matchup against Phenom University, Lee did some really nice things to help keep his team in the game. The 6-foot-3 forward was an excellent shot blocking presence and moved well in the zone defense, coming over from the weak-side and pinning shots on the glass. A plus-length prospect who can get out and run, Lee made things happen in transition as well. He’s a fluid athlete that covers ground without taking a lot of steps and was able to get coast-to-coast with ease. Playing up with the 17U group, Nau isn’t fazed by the competition. The sophomore guard doesn’t have that natural deer in the headlights look that you’d expect to see from someone in his position. Instead, Nau has been aggressive offensively, while still balancing his duties as a floor general. The 6-foot-2 guard plays at a high pace and can be deadly from 3-point range. Nau moves well without the ball and gets great elevation on his shot. Also a gritty defender that loves to take charges, Nau is one of the toughest players in Wisconsin and will step in front of a train if it means taking two points off the board. A prospect to take notice of during the travel season, Parzych was outstanding during a Saturday morning win. The 6-foot-1 guard has terrific playmaking ability as a scorer and facilitator. Parzych broke down defenders with ease and carved up the opposition with a flurry of dribble drives and assists. The lefty reacts very quickly on the floor and always seemed to be one step ahead of the defense. Parzych can survey the floor and find open teammates without necessarily making eye contact, which left defenders helpless. He played with really good pace all morning, using a quick first step off the catch as the opposition had to constantly help and recover when Parzych was on the floor. What a weapon Meanstreets has off their bench. Peters just catches opponents off-guard, coming into games midway through and lighting it up from beyond the arc. Peters has a smooth and effortless stroke. He’s adequate at working through screens and freeing himself on the perimeter and can score off-balance. The 6-foot guard is drawing some Division 1 interest going into the spring evaluation period. Phenom University got off to a slow start against CGE on Saturday. Resch came off the bench and helped his team gain separation. After he made his first shot, the sophomore sharpshooter caught fire and didn’t relent. Resch can extend his range beyond the arc and forces defenders to stay glued to him at all times. While he’s undersized, Resch isn’t afraid to attack when he sees an open lane or get coast-to-coast in transition, using a high-arcing floater to avoid shot blockers. For whatever reason, Schaefer seems to play really well against EYBL teams. Despite a loss to Mac Irvin Fire, the junior guard was very impressive for a large stretch of the game, putting the Swing on his back. Schaefer was draining triples and connecting on his floaters against the Fire’s athletic front line. Even in a track meet, Schaefer can keep pace with athletes and isn’t afraid to push the tempo and get coast-to-coast against some of the nation’s most loaded rosters. After missing a huge chunk of his junior season, Schaefer appears to have returned to form. Smith is just a beast on both ends of the floor. An athletic specimen, Smith turns heads with his leaping ability. Whether it’s a dunk right now down Main Street or a chase down block, Smith’s ability to impact the game above the rim was on a different level from just about every other prospect on Saturday. When he’s knocking down his perimeter shot, Smith becomes very difficult to guard. If those perimeter skills catch up to his athleticism…watch out. A highlight reel passer and facilitator, Wheeler was impressive in a Saturday morning victory. The way he changes pace and hesitates with the ball in his hands, Wheeler was dropping dimes and completely fooling the defense. The 5-foot-9 lead guard is speedy and has a lightning quick first step. Living in the paint for 30 minutes, Wheeler was the straw that stirred the drink for The Family to help them advance. Wonders shot the ball well en route to a game-high 23 points against the Illinois T-Wolves. With the opposition sitting in a zone, trying to take away Phenom’s athletes, Wonders made them pay with rhythm jumpers. More than just a spot-up shooter, Wonders has a very smooth one-dribble pull-up, taking advantage of defenders who fly out at him. Helping out with the shorthanded 17U squad, Wonders has been doing similar things while playing up a level. The 6-foot-5 sophomore already has offers from Central Michigan and UW-Milwaukee. Wonders will be highly coveted at the mid-major level, but if he can improve his quickness and athleticism, can play high major ball.